If you ask a Modenese how to season the salad, the answer is almost off: pour on 3/4 Extra Virgin Olive Oil, 1/4 Traditional Balsamic Vinegar and a pinch of salt. You will surely have a seasoning that will give your dish a unique and inimitable taste. The flavors of our Traditional Balsams used in raw will be sharp on your palate and will inebriate you. This Balsamic Vinegar salad dressing is surely the world’s best known way to use the Orignal Balsamic Vinegar of Modena. Combining vegetables is surely the most common use method for this extraordinary product, but, in our opinion, very limited use in spite of the many possibilities of culinary use. 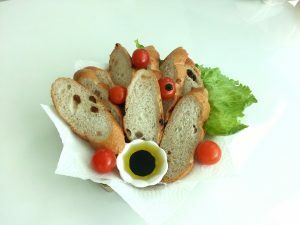 Another method to create balsamic vinegar salad dressing is to mix: Extra Virgin Olive Oil, Mustard, Balsamic Vinegar, honey and add a pinch of salt. You will get a tasty seasoning where, however, recognizing the taste of vinegar will be much more difficult. B ut we do not limit the use of Balsamico in this way, the unique and unrepeatable features of this product will allow you to perform hundreds of different recipes by creating the most varied and satisfying culinary marriages. I remind you that for a practical and proper use in the Balsamic Vinegar kitchen you will always have to use the Traditional PDO product, while BGI Vinegar can be put on the flame. Do not forget our precious advice: try the traditional at raw after dinner using a spoon (if possible) of ceramic, it will also be an excellent digestive. Discover the pleasure of sharing this food jewel with people who appreciate excellence.